Last night I was lucky enough to attend a wine pairing dinner, part of the Langham Food and Wine Festival and held in the Star Room of the Langham, with Frescobaldi wines and creations by Chef Igor Macchia, Co-Owner and Chef of 2 Michelin Star Ristorante La Credenza in Piedmont, Italy. The dinner highlighted both the diversity of this very famous and historical vineyard as well as the unique, quirky talent of Chef Macchia. A wonderfully inventive, Italian meal with modern twists… is about all I want to say about the “food philosophy,” to avoid a ramble. The dishes speak for themselves. Here is what I had. 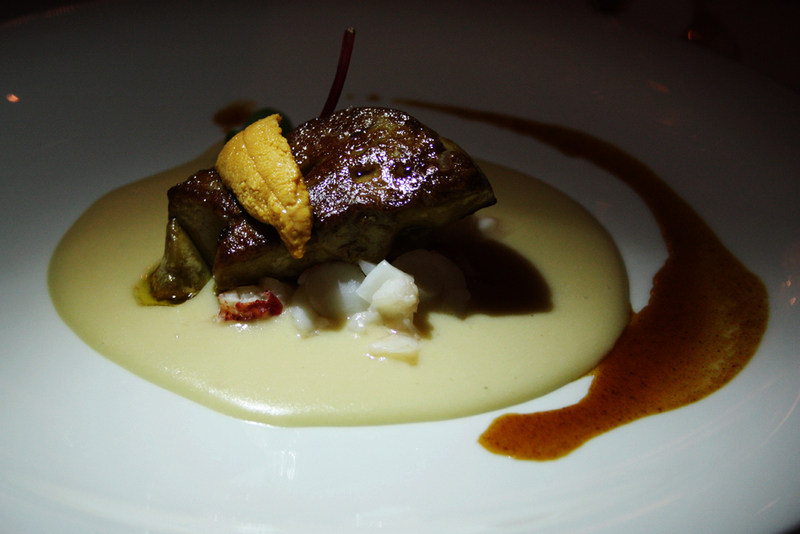 Foie Gras, Lobster, Sea Urchin and Smoked Potato. 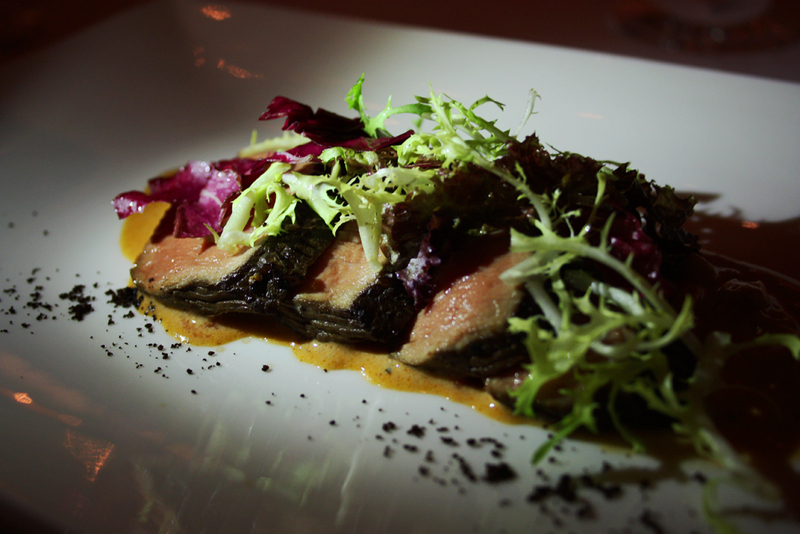 A grossly, unabashedly luxurious first course and a great preview of what was to come. The foie was seared to perfection, with a wonderful bite provided by the taught, stretched exterior casing which was also slightly charred, crispy and delicious. Once past the bite, the interior (closer to rare than medium) gushed forth with a buttery and moist, virginal frailty, mixing with the browned, crispy bits and oil on the surface. 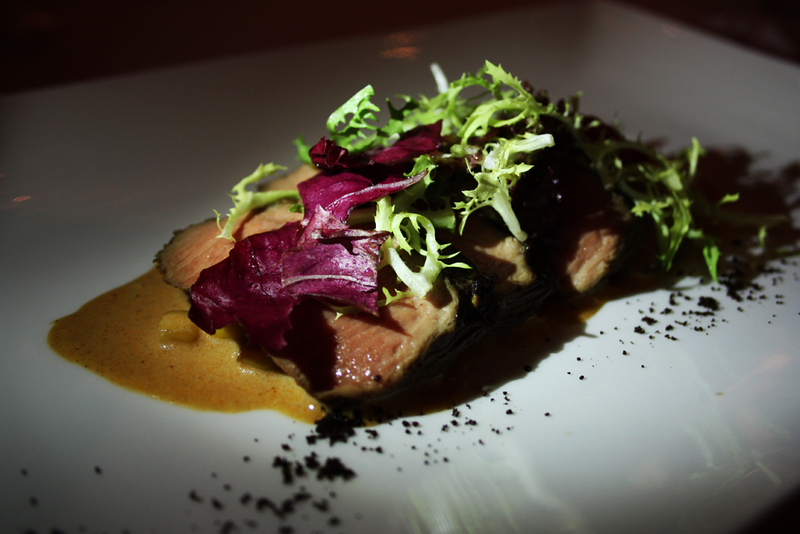 The very subtly flavored smoked potato puree at the base was a great complement, echoing the smokiness of the foie, while providing a mild, sweet flavor and a velvety smooth texture for the liver to play in. The generous portion of sea urchin coral lain casually over the top was really what flew this dish to the stars, however. Pillow-soft, almost like a custard in texture, the smooth, wet little tongue of the ocean, with that wonderfully pungent low-tide brine present in both its aroma and amplified 1000 times in its flavor. When combined in the same mouthful, the very similar textures of the two melted together instantly on the palate – the marine, acid notes of the uni locked in a desperate, frantic embrace with the earthy base of the foie. Crisp chunks of white fleshed and red speckled lobster peeped the romance between the two protagonists and gossiped about it in hushed tones, picking up the combined flavors of the dish (brine, smoke, earth) and projecting it on their own buttery, tender canvas. The liver’s salty, smokey, charcoal searing juice was drizzled on the side of the plate, offering to lift up the rich, creamy potato puree but was left untouched in my case. Paired with a Marchesi de Frescobaldi Pomino Vinsanto DOC 2005, a sickly sweet, dried date and apricot dessert wine that went very well indeed. 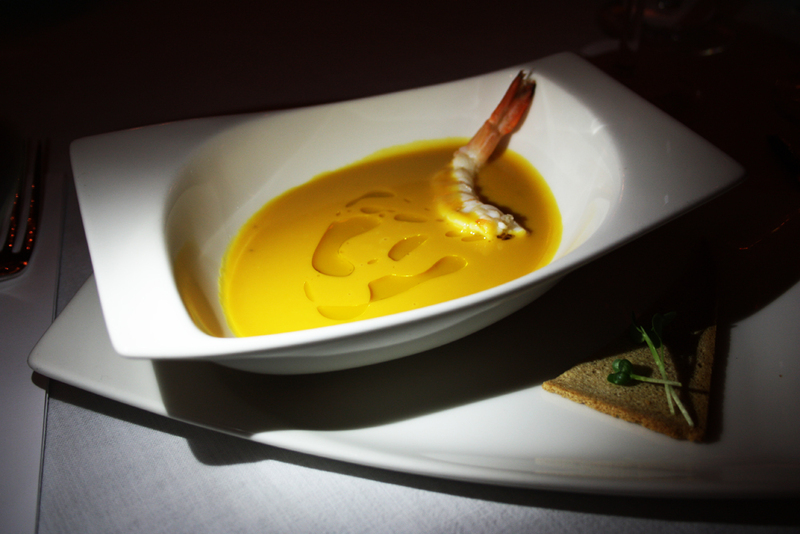 Pumpkin Soup Flavored with Lemon and Rye Bread, Steamed Prawns and Frescobaldi Olive Oil. Stunning in color, very mild in flavor. The naturally sweet, vegetal flavors of the roasted pumpkin were allowed to shine through brilliantly without too much nutmeg, cinnamon, clove, all spice, cliche autumnal seasoning to kill these flavors while, ironically, attempting to bring them out. The latter happens far too often with pumpkin-flavored anything, really, and I’m glad it didn’t happen in this bowl on this night. That being said, I thought there was a TAD too much olive oil lacing the surface of the soup (it was almost impossible to get an oil-less spoonful) and the oil, being a bit green, unripe and thus packed with youthful olive essence, threatened to overpower the subtle, caramelized roasted veggie tones of the pumpkin. A more mature and thus more subtly flavored golden oil might have gotten along a bit better. Or maybe just a drop of the green stuff would’ve been ok. Still, in the end, I found this a great dish. The steamed, undressed prawn dipped into the soup was a nice complement with its very soft sweetness accentuating the similar subtle sweetness of the pumpkin, while also adding a nice textural contrast to the dish. This was paired with the Marchesi de Frescobaldi Pomino Benefizio Riserva DOC 2010, a very crispy cool, citric and floral white. We were instructed to try pouring a tiny bit of the wine into the soup and mixing it, to allow the two Frescobaldi liquids to melt together in the company of the creamy pumpkin base. We did, and it was great. The wine lifted up the heavy, creamy texture of the soup, while adding a citric zing to it. 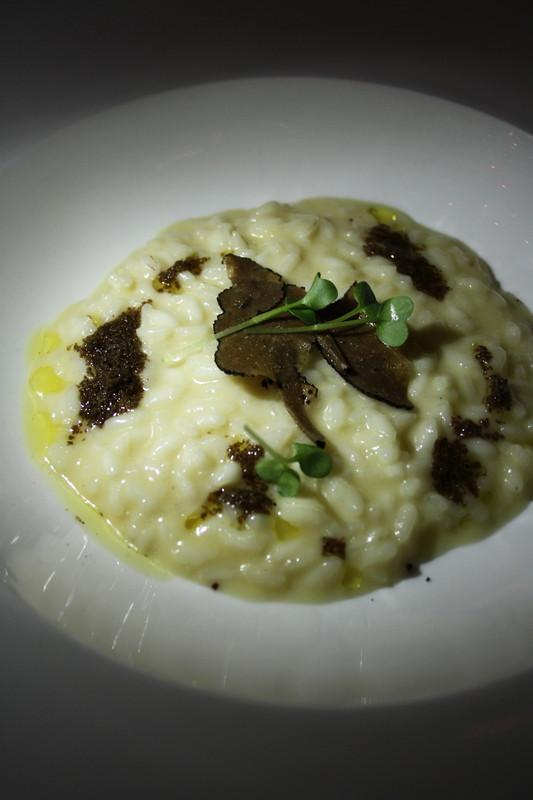 Piedmont Cheese Risotto with Coffee Powder and Black Truffle. By far my favorite of the night. The risotto was extremely delicate in its texture – a creamy, warm, comforting pudding with perfectly cooked, not overcooked, al dente rice – any heaviness of the liquid starch from the rice was lifted magnificently by that fresh, green oil drizzled over the top. The Piemonte cheese used within was surprisingly sharp at first with a blunt finish. Pungent, fungal, earthy, chestnut-hazelnut black truffle was shaved over the top of the risotto, while blobs of black truffle paste melted from the heat of the stuff, mixing its uber masculine and charismatic mineral-soil musk sensually into the risotto’s creamy, cheesy base. Peppery little watercress went beautifully with the truffle, freshening it up in texture, while adding a complementary spicy flavor. Skimming the good stuff off the top of the risotto was not an option in this case, because what gave the dish its creative flair was what lurked underneath the risotto, a bitter, grainy coffee powder which was thrown together with the black truffle (like black pepper often is) to see what would happen. The marriage was a success – the familiarly bitter sensibility of the coffee tamed the audacious, macho musk of the black truffle, bringing out the some of the softer flavors behind that fungal funk. The dish was paired with a Marchesi de Frescobaldi Nipozzano Riserva Chianti Rufina DOCG 2008, whose spicy, peppercorn tones went beautifully with the dish and whose tannins were soft enough not to kill any of the more subtle flavors within the dish. 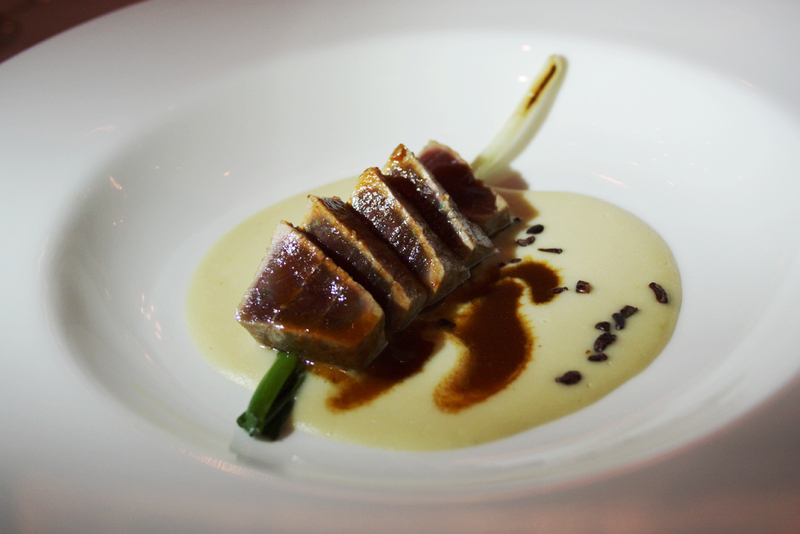 Pan Fried Tuna Loin with Wasabi Sauce, Spring Onion and Cocoa Nibs. In this case, the idea was fantastic but the execution in the kitchen was a tad flawed. I received overcooked tuna (compared to those of both of my table neighbors, one of which is pictured here) that was 8-2 rare:sear vs the 9:1 ratio I was practically drooling for. Nevertheless… The tuna was of very nice quality, purplish red and smooth, falling apart raw and cool at the grain, allowing the tongue to slip between two chilled, pillowy flakes of flesh when chewed. The sear was nice, only slightly seasoned to allow the fish to shine. The slices were leaned against a fresh, crisp but soft stalk of slightly charred spring onion in a pool of creamy wasabi sauce and drizzled in a soy-based salty pan-jus. I thought that the wasabi could have been a bit more powerful in the dish as an eye-moistening, lymph-node-opening icey cool spice because the tuna was already very subtly seasoned and thus looking for some strong flavor besides its pan juice. The cocoa nibs sprinkled into the sauce provided deep, earthy, bitter cocoa flavor but only when directly crushed between the teeth, so they didn’t really bleed out any of their essence into the sauce or add it to the fish. The dish was paired with a salty, woody, mineral Marchesi de Frescobaldi CastelGiocondo Riserva Brunello di Montalcino DOCG 2003, which I thought a bit too heavy with the tuna, especially since the latter was, in the end, not seasoned very strongly. Lamb Marinated in Coffee, Sweet Corn Ragout and Aromatic Cress. This dish was very near flawless. Juicy, cool slices of lamb only very slightly cooked, bleating out (pun) that wonderfully iron-graphite mineral flavor through every single fiber of its flesh. In this case that minerality was combined with the slightly bitter, earthen cigar flavors of the coffee that the animal was marinated in and sprinkled with as well. At the base of the meat was a wonderfully thick, sweet corn ragout flavored with a bit of paprika or some other red chili powder to give it a slightly smokey depth as well. The natural, floral, honey-like sweetness of the corn offset the bitterness of the coffee beautifully while the cress over the top of the lamb lifted the dish a bit with its cool green freshness. The lamb was paired with a Marchesi de Frescobaldi Mormoreto Toscana IGT 2008 whose cinnamon-y, black current and sweet cherry jam flavors went very nicely with the meat. The only flaw of the dish was that in presentation it was a bit too similar to the one preceding it, which made it a bit dull to switch from one to the other. Otherwise, very nice. White Chocolate and Lime Mousse, Orange and Fresh Fruit Infusion. A wonderfully light, interesting and creative dessert. A velvety smooth mousse of sickly sweet, vanilla-wax white chocolate and tart, green key lime lifted up by an aromatic, perfectly positioned sprig of mint. 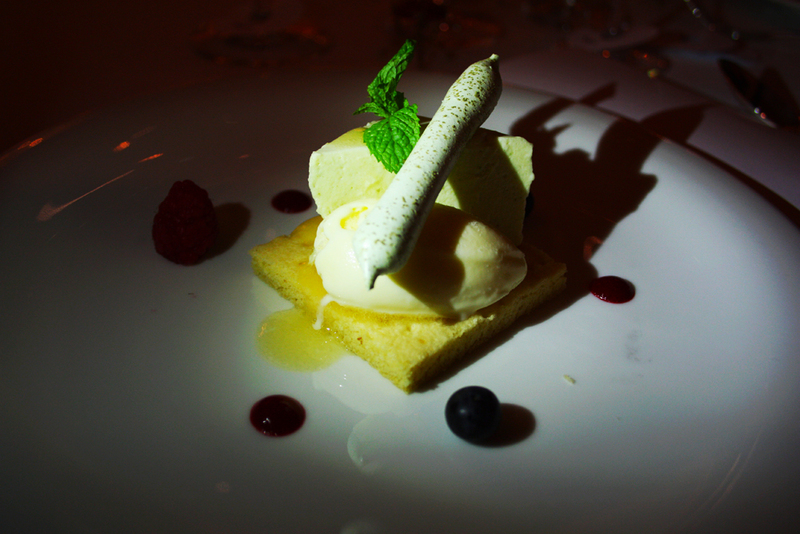 Besides it, a cool dollop of refreshing orange sorbet, melting nicely onto a buttery, flaky lemon shortbread. A crispy pistachio-ed log of airy merengue lying over the thing, adding nice textural contrast. Tart little blueberries and raspberries, as well as specks of raspberry syrup dotting the plate. This was paired with a Marchesi de Frescobaldi Pomino Late Harvest DOC 2007, a very nice, creamy wine of citrus, orange and honey which matched it beautifully. 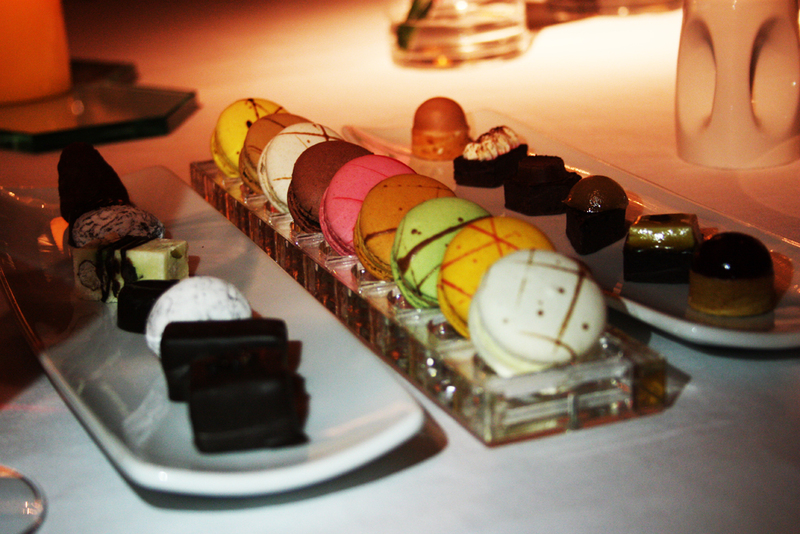 Dinner finished off with wonderful petit fours – bonbons and macarons paired with a Frescobaldi grappa that woke up the senses to enjoy these last few bites.